Scotland’s women performed marvellously to reach the final of the World Rugby Women’s Sevens Series Qualifier in Hong Kong earlier today (Friday). The Scots, with three Borders players among them, saw off Papua New Guinea before gaining revenge on Japan for a defeat in the pool section, to reach the last stage. Victory would have given our ladies a place in the HSBC World Rugby Womens Sevens Series – but the Scots stumbled at the last hurdle against a powerful Brazil side. Scotland went in front against the Brazilians, thanks to an early try from Lisa Thomson, ex-Hawick High School pupil and captain of the Scottish international women’s XV. Brazil, however, hit back with two converted tries to lead 14-5 at the turnaround. The Scots recaptured the lead at 19-14 with tries by Abi Evans and Rhona Lloyd, both converted by 7s skipper Helen Nelson. But two more converted scores signalled glory for the South Americans, with a final score of 28-19. Jedburgh’s own Chloe Rollie joined Lisa in the starting line-ups on day two of the Cathay Pacific HSBC tournament in the Far East, while former Selkirk High School pupil Mhairi Grieve – a try scorer against Mexico on the first day – came off the bench in each game. The Scots began with a fine 36-12 victory in the quarter-final over Papua New Guinea, with Chloe scoring Scotland’s last two tries. Then, in the semi-final, they faced Japan, who had inflicted their only defeat of the Pool A campaign the previous day, winning 27-19. But the Scots ladies responded superbly to win 24-19, with the lead changing hands during the game. 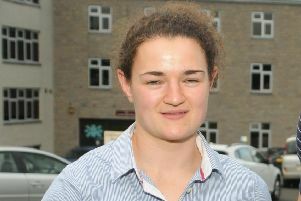 Chloe again made certain of the Scots’ victory with their concluding try, converted by Helen Nelson. Then came Scotland’s valiant showing against Brazil, who had narrowly defeated Poland, Kazakhstan and Argentina in the group stages, Kazakhstan again in the last eight and then Kenya in the semi-final.